The starting gun sounded at 9am on Monday morning and the runners and riders lined up for the Great Leeds United v Aston Villa Ticket Steeplechase. While juggling a class of 31 children, I elbowed my way belatedly into the queue, but as, one-by-one, the faithful took to Twitter to announce their gleeful satisfaction, I remained ticketless at 10, gazing in forlorn hope that the Family Area tickets I had optimistically placed in the basket would magically become valid. Back in 2008, in our relative youth, myself and my good friend Ciaran Fox made a hopeful journey to Dublin for the All-Ireland Football Final. 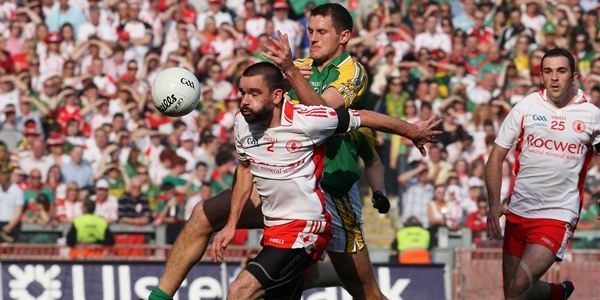 With little more than the ticket price in our pockets and naivety in our hearts, our plan was to venture south in the hope of securing a ticket outside the ground to see Tyrone take on Kerry. With two fan bases known for their travelling hordes and with it being the pinnacle of the sport, our chances were slim – wisp-like even. When we encountered our friend Michael Gerard Doherty’s father Mick, we attempted one last shot at glory and after a brief chat about how we thought the game would go we tentatively enquired if he knew of any available tickets. His response was both as succinct as it was demoralising. With a pat on the back and a wry smile he sounded the death knell on our afternoon of live action as he disappeared into the crowd that milled around outside Quinn’s. Yesterday morning, I could almost feel Mick’s pat on the back and see the wry smile as section after section of grey unavailability stared at me from the forbidding screen. I consoled myself in the knowledge that, as the club had limited sales to one per season ticket holder and member, at least true fans would be filling those terraces. The reason for the club’s policy was clear. In recent weeks Elland Road has been selling out with regularity, but while the cause for the demand is more than welcome, the side-effects of ticket touting is an anathema. 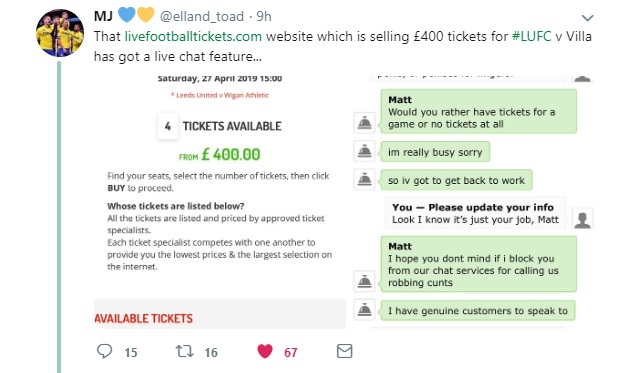 Earlier this afternoon, @elland_toad on Twitter shared a screenshot from livefootballtickets.com that showed a ticket to the Aston Villa game on sale for £400, around ten times face value. Their live chat function was well-utilised to voice this user’s distaste, but the exchange leaves a bitter taste for genuine fans. The clamour for tickets in recent weeks has whipped Leeds supporters into a panicked frenzy. Coupled with the fear of on-field collapse is the constant anxiety over securing of tickets to view any potential promotion triumph. We have been waiting longer than Sting for this release, a release that might not even arrive. Send out an SOS. Into the mists of panic have stepped the shady characters that skulk in the proverbial shadows of any sought-after event. The convenient veil thrown around them by the internet gives them even greater scope to operate, but the most sickening aspect of this episode is the fact that they have circumvented the club’s policy. Owing to the fact that we needed a season ticket or membership to be able to purchase tickets for this game, these unscrupulous either qualify for the above or have allowed their club loyalty to be monetised in an unsavoury manner. Let me be clear. If you are a season ticket holder or member at Leeds United and you are either re-selling match tickets for extortionate rates or allowing your membership to be manipulated in such a way, you are a ruinous smear on the tapestry of this great club. You are the disembodiment of the “Side Before Self” mantra championed by the great Billy Bremner. You should hang your head in shame as you pass his statue outside the stadium. I understand the desperation that will be there to get into this game and the “Take it or leave it” policy of the touts, but please don’t give these parasites what they want. I hope the club has ways and means of finding out who resold these tickets and dealing with them accordingly. In the meantime, has anyone any legitimate spares going? In my head I can hear you all echoing the response of Mickey Doc over a decade ago.